The latter two songs are on the second side of the record, which I started after inserting some Bette Midler in, because it was a slow workout, made even more so with the singing going on. I do have to mention that side two began with The Everly Brothers’ “When Will I Be Loved,” which was hard to belt out while doing sit-ups and leg lifts, but I tried. 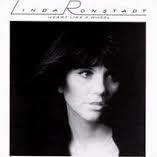 Needless to say, I loved this album then, and I love this album now, and you can scoff at me if you want, but Linda Ronstadt was and is a great talent. And what’s even better is that I really wanted to write tonight.